Trek's top of the range Émonda SLR range is ready to take you up the steepest of ascents whilst providing you with the tools you need to tackle the descents. The ultralight frame (665g with Vapour Coat paint) is Trek's lightest ever disc road frame. Whilst incredibly lightweight it is also super responsive and stiff thanks to Trek's H2 geometry and fitting position. The Émonda is a great option for those looking for a road racing option or a bike to tackle continental mountain ranges or even hilly routes a little closer to home. Flat mount hydraulic disc brakes provide blissful braking on all surfaces and in all conditions, that won't threaten to falter when the rain comes down or road muck gets thrown up at you. Finally, the SLR 8 edition of the Emonda range features the improved Bontrager Aeolus Pro 3 disc and tubeless ready wheelset, when compared to the SLR 6 as well as the super lightweight Shimano's Dura-Ace 11-speed hydraulic disc groupset that ensures fantastic braking on every surface, in every condition. You value all the advantages of a lightweight ride and know better braking means faster, more confident rides. You want the ride quality found only in Trek's highest-end carbon Émonda frame with a top-shelf mechanical drivetrain. 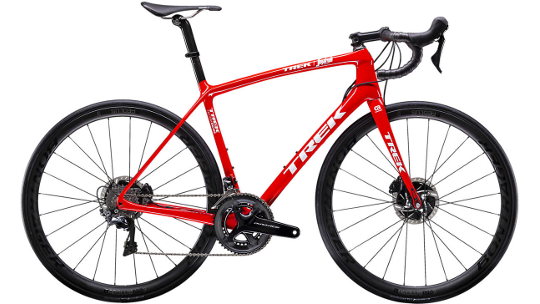 Trek's lightest 700 Series OCLV Carbon frame, a full Shimano Dura-Ace drivetrain, Aeolus Pro 3 carbon wheels and the confidence, better braking modulation and all-weather stopping power of flat-mount hydraulic disc brakes. 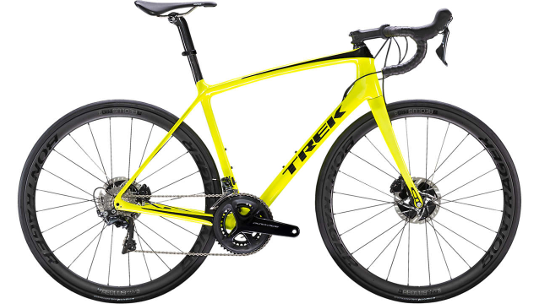 Trek's lightest disc frame ever (665g with Vapor Coat paint), pro-level race components, unmatched ride quality and the better braking performance of flat-mount disc brakes. Who says you can't have it all?